St. Jonah, who entered this world as Vladimir Pokrovsky, was orphaned at an early age and adopted by a village sexton, who gave the child his own surname and an upbringing. After successfully completing the Moscow Zaikonospassky Theological School, he enrolled at the Kaluga Seminary, which graduated him with honors. Thereafter, he advanced to the Kazan Theological Academy, following the completion of which he stayed on as a private instructor in the department of New Testament Scripture. In his third year, Vladimir was tonsured a monk and given the name of Jonah. His spiritual father was the renowned elder Gabriel Sedmiyezersky, a man locally revered as a saint. Father Jonah was also a pilgrim at the Optina Hermitage, and, at the outset of World War I, volunteered at the front in the capacity of a military chaplain. The revolutionary years would bring him great suffering at the hands of the Bolsheviks. He would be arrested, brutally beaten until he lost consciousness, and have all his hair violently ripped out. Miraculously, the future saint survived and managed to escape. 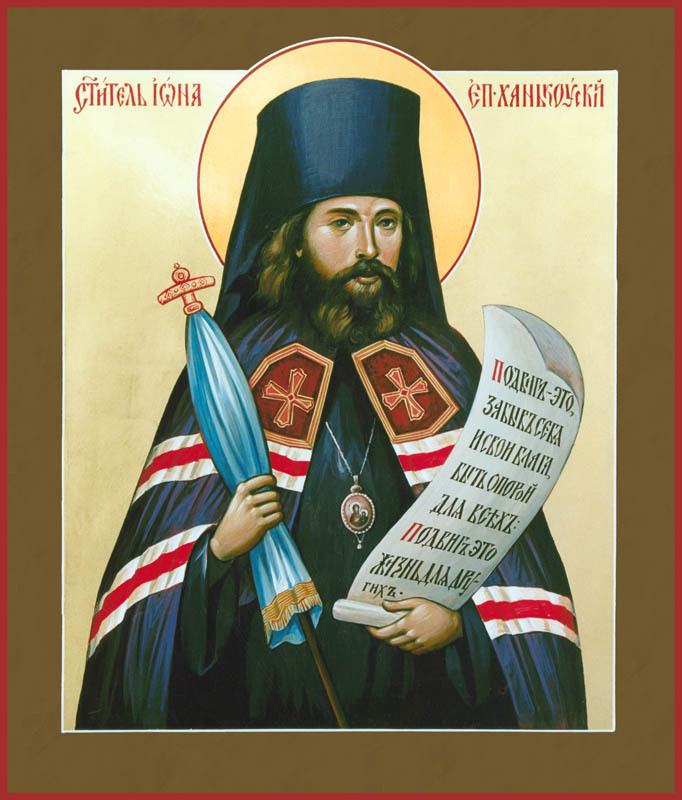 Abbot Jonah spent the Civil War fighting the Bolsheviks in the army of Admiral Alexander Kolchak, within which he founded the Detachment of the Holy Cross. He then served as head priest of the Orenburg Cossack Army, led by Ataman Alexander Dutov. Alongside these men, St. Jonah braved the perilous march over the Golodnaya Steppe, and apace with the Cossacks, who had endured great losses, he overcame the frozen Pamir Mountain pass to find himself in Xinjiang—Chinese Turkistan. Following the assassination of Ataman Dutov, Abbott Jonah became the only surviving advocate for the Cossacks, who were now in China without any resources. He traveled to Peking intending to seek aid from the Russian Spiritual Mission. In January 1922, Abbott Jonah sent an account of his life and work to the chairman of the interim Higher Church Council Overseas, Metropolitan Anthony (Khrapovitsky), who was then residing in Sremski Karlovci, Serbia, and offered to devote himself fully to the Council and its work. In response, the Council issued a decree to elevate Abbott Jonah to the rank of Archimandrite and entered his name into consideration for the bishop’s cathedra. The cheirotonia (consecration) of the new bishop was performed on September 18, 1922, at the Russian Spiritual Mission in Peking. Among those serving were Archbishop Innokenty (Figurovsky) of Peking and Bishop Simeon (Vinogradov) of Shanghai, along with Bishop Miletius (Zaborovsky) of Zabaikal (later Harbin). As bishop, St. Jonah would head the vicariate in Xianjiang (Hankou) and be appointed Dean of the mission’s church in the city of Manchuria, where he arrived on October 19, 1922. “All that had been spared by the Civil War, which had rolled out like a wave as far as Manchuria and had no strength to go further, all that was left to do in Manchuria was to bellow with sorrow and combat want; without strength, without resources, often without health and even without faith in God …” The population of the city of Manchuria, as it had come from different parts of Russia, with respect to religion, had not been brought up in the proper manner. The new and vast church of the mission was patronized by very few worshippers, and missionary work had fallen into disarray. The zealous servant of God’s church and renowned missionary, the young and energetic Bishop Jonah, took it upon himself to, first and foremost, establish his flock in the religious-moral sense. He institutes the prescribed church services, establishes a wonderful choir, gives sermons tirelessly; the church is filling up with faithful and is finally getting crowded." Thanks to his efforts, the St. Innocent Church was renovated, and a side chapel dedicated to St. Nicholas was annexed to the building. The saint would attend the early liturgy, which was unfailingly held there on feast days, after which he would serve the late liturgy at 10 o’clock. In his vigor, St. Jonah did not limit his efforts to the church. St. Jonah began to work on gathering funds by sending out letters and telegrams to all the cities of the Far East, to the Chinese Eastern Railway, to banks, trade companies, high-ranking officials, and wealthy people. The response came in the form of a flood of donations from all sides, business propositions, and offers of services and aid. Among the donors were such people as General Chu-Tzin-Lan, the former Head of the Neutral Zone who transferred up to 300 Mexican dollars each month, and E. N. Litvinova, who donated 600 Mexican dollars each month. An intelligent and practical person, St. Jonah understood that funding the work of charitable organizations through donations alone would be impossible, so he shifted to using new means. He created a commercial division within the committee, the main goal of which was to independently earn money that would fund charities the committee had founded. Starting capital was provided by private companies and banks. The accounts of his contemporaries attest to the fact that Vladyka was so trusted, that his word alone backed an investment of tens of thousands of rubles. At a time when private ventures were widely failing, the commercial division founded by St. Jonah not only survived, but thrived. It was not, of course, without its enemies. The International Committee’s orphanage cared in full for 30 orphaned children, ages 5 to 14 years: 15 boys and 15 girls. Nearly all the orphans attended the International Committee’s school and supplemented their studies with vocational courses that prepared them for employment. For infants abandoned by their parents, the committee hired wet nurses. Mordokhovich would attend Vladyka’s funeral and weep most bitterly. Missionary and educational work held a special place in his heart. Upon the request of the Municipal Council, he taught the Law of God at a local high school, and did so in such a way that students petitioned to have an exam on the subject, regardless of the fact that it was not stipulated by the curriculum. He regularly gave open lectures on a variety of topics, published leaflets on religious and moral subjects, and taught theological courses in Harbin. The bishop even had great success at lifting spirits among Manchurian residents by hosting an “Evening of Russian Song,” complete with tea stands. As many as 500 people attended free of cost the elementary and middle schools founded by Vladyka. Of those students, 211 did not have to pay for textbooks, and 139 benefited from free lunches. The committee schools implemented the curriculum of the Chinese Eastern Railway until 1925. In addition to academic subjects, the school curriculum offered vocational training: shoemaking, pottery, textile work (weaving brocade), sewing, hosiery, metalwork, carpentry, and other subjects, such as sculpture, as well as Mandarin language and accounting. The cost of operating the school was 1,050 rubles a month. Each day, a free cafeteria, served up to 200 free lunches to children of the poorest population, ages 3 to 17 years. On August 1, 1923, the International Committee opened a free outpatient clinic providing medical aid and distributing medicine to the most impoverished sectors of the Manchurian population and surrounding territories. Next door there was a free dental office. Prior to the Saint’s arrival, medicine was impossible to acquire. He formed a council of local entrepreneurs and convinced them to open a pharmacy dispensing medicines to the poor at no cost. The pharmacy was called “Pushkinskaya,” after the main street. In addition to medical care and free medicine, certification of illness and disability were provided to the poor, and a petition was started to provide passports free of charge. The following appears on a contemporary medical record: medical care has been given to 6,387 people in one year. Medicine was provided according to 2,886 prescriptions, in addition to the medical care offered to those studying at the schools of the committee. With the backing of patrons like the Gagins, Tuliatoses, Yalamas, Sapelniks, Ashikhmins, and others, he established modest enterprises which, though they provided only a modest income, created jobs for the hands of the poorest workers of the Zarechensky refugee camp. Their metalwork and pottery were well known in the Harbin marketplace for being particularly durable and beautifully made. The following is a list of the enterprises St. Jonah started during the three years he resided in Manchuria: (1) Orphanage, (2) Elementary school, (3) Middle school, (4) Soup kitchen, (5) Free outpatient clinic, (6) Pharmacy with an allotment of free medicine for the poor, (7) Vocational courses at schools, and (8) Library. 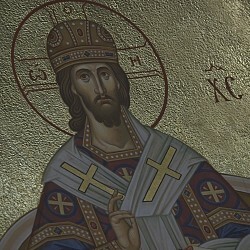 Bishop Miletius recalled that when the saint received a friendly suggestion that he, a bishop, ought to change his old, shrunken winter coat for another—a better one, more worthy of his station—he jokingly replied that his winter coat was good enough for him and that a better one couldn’t be bought for twenty rubles. He was adept at securing resources for others but spent hardly anything on himself. All his personal funds were dedicated to charity work. His work teaching the Law of God entitled him to a pay of 426 dollars and 40 cents. He refused the money, and the salary acted in lieu of tuition for some of the underprivileged students. Ten people completed their education at no cost. Ever friendly, ever cheerful, and an engaging conversationalist, the Saint was loved and respected by all those around him. As the accounts of those who knew him will attest, a constant stream of people called on him—some for advice, others for help. The doors of his unassuming apartment stayed open from 7 in the morning until 10 or 11 o’clock at night. Then, at 11 o’clock, when there was nobody to disturb him, Vladyka would sit down to work. And on feast days, squeezing into the room was impossible. Russians, Chinese, and foreigners alike longed to speak with Vladyka. St. Jonah left this world unexpectedly, at the age of 37 years, exactly three years after his arrival in Manchuria. He was not accustomed to caring for himself, and so when he developed tonsillitis, he did not turn to a physician but instead rinsed his throat with kerosine. A contaminated dose caused the onset of sepsis. Day and night, people came to pay their respects before the remains of the deceased. His funeral was attended by all of Manchuria and the outlying settlements, mourners coming together regardless of nationality or faith. Three thousand copies of his will were made—barely enough for half of those in attendance. St. Jonah was canonized by the Russian Orthodox Church Outside of Russia in 1996. His glorification coincided with the day of his death and was decreed to be celebrated on the day of his remembrance: October 7/20. Holy Father Jonah, pray to God for us! The author would like to express her gratitude to Varvara Georgievna Kondrashev ( nee Theodoridis) for providing archival materials. Article re-published with the permission of the Executive Editor of "Spiritual Spring,"
the official journal of the Western American Diocese.